Download the sample wording for negative engagement letter. 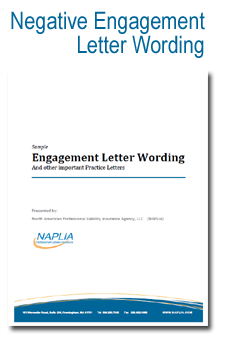 Engagement Letters provide you with essential protective wording for your practice. Additionlly, they allow you the opportunity to market additional services and ultimately create a stronger relationship with your clients. Download sample Negative Engagement Letter Wording Now!